the bike lane on NE Tillamook. It’s that time of year when the beauty of fall becomes a bane to bike riders. 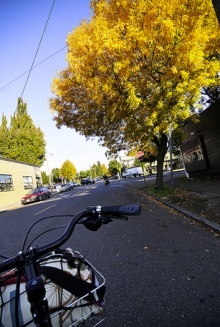 We marveled at the leaves last month and rejoiced while riding through them. 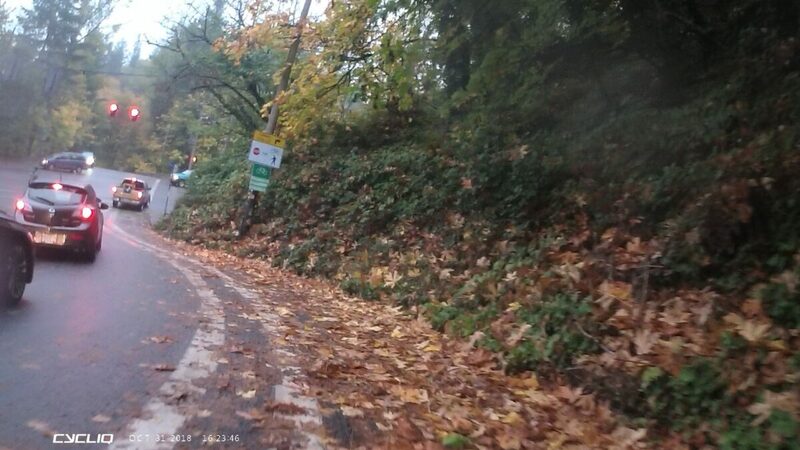 But now that we’ve gotten soaked and many of these leaves haven’t been swept up, they have become yet another unnecessary annoyance that adds to the dangers and difficulty of bicycling during this time of year. Unfortunately, it’s not just Mother Nature or a lack of city sweeping that’s causing this problem. 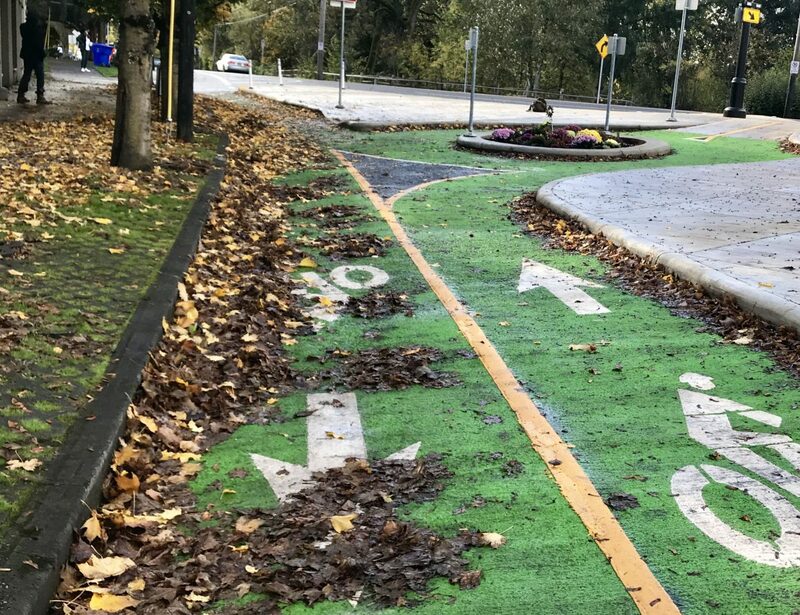 We’ve seen for ourselves and have had readers contact us about landscaping crews that are blowing leaves into bike lanes. 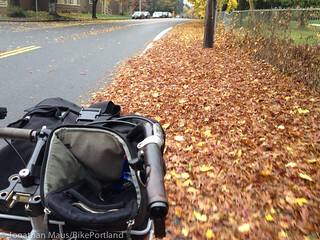 After the burst of fall was followed by stiff winds and rain last night, leaves are covering many bike lanes in Portland. 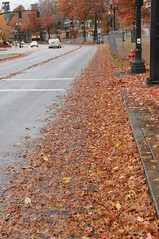 For cars, leaves aren’t a big deal, because the mass, velocity and tires on a car act like sweepers to keep lanes clean. 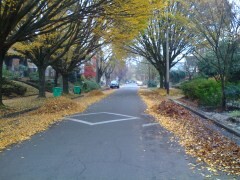 But bikes aren’t big enough to have that same effect, so the leaves pile up. The dangers of leaves are two-fold: Ride in them and risk slipping out in the slimy muck; ride around them and risk getting hit by other traffic in other lanes. Add in the early darkness of the evening commute and it becomes even more important to keep bike lanes free of debris and hazards. Fall colors on SE Ankeny. With this picture perfect weather we’ve been having I decided to take the long way home yesterday in order to see some fall colors. At the recommendations of some friends, I found my way to SE Ankeny where the bright yellow leaves of golden ash trees (thanks for the identification help Esther!) lined the street. 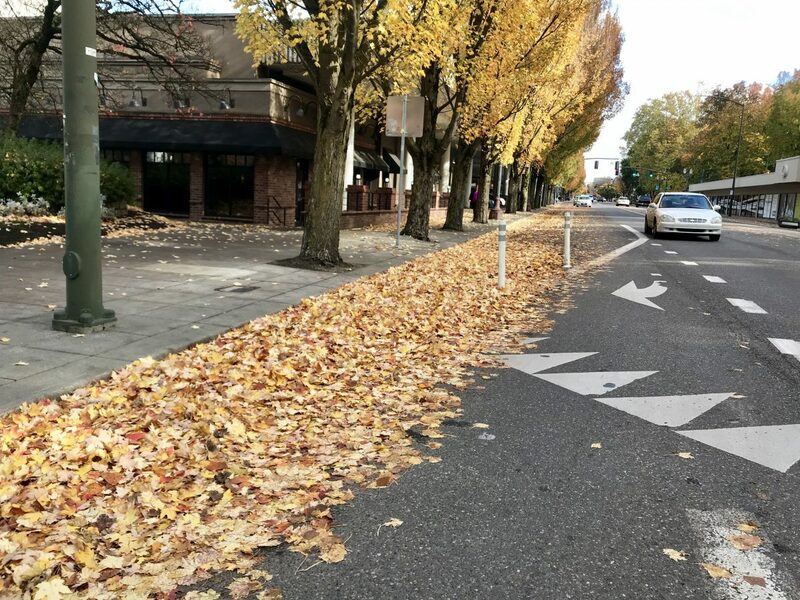 We’ve been following the issue of leaf piles as a danger to bike traffic both in Portland and, most recently, down in Eugene. Bike advocates in Eugene are pressing the city to clean up the problem. Shane Rhodes is a Eugene-based bike advocate and has been active on the leaf issue. He’s also on the City of Eugene’s Bicycle and Pedestrian Advisory Committee and sent us an update from their meeting last night. He also sent along the text of an entertaining letter to the editor from today’s Register-Guard newspaper and his response. 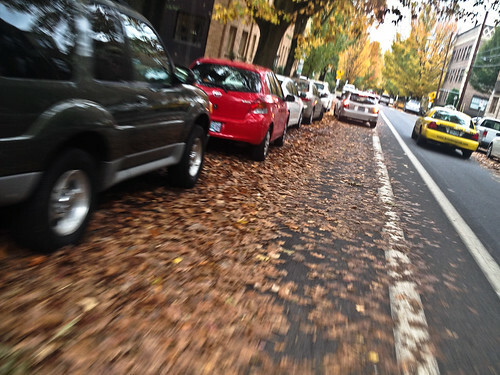 Could proposed “leaf tax” sweep away a bike safety hazard? Leaves where bikes like to be. Every fall in Portland, mounds of leaves pile up on neighborhood streets, creating slippery conditions on road shoulders and sidewalks. 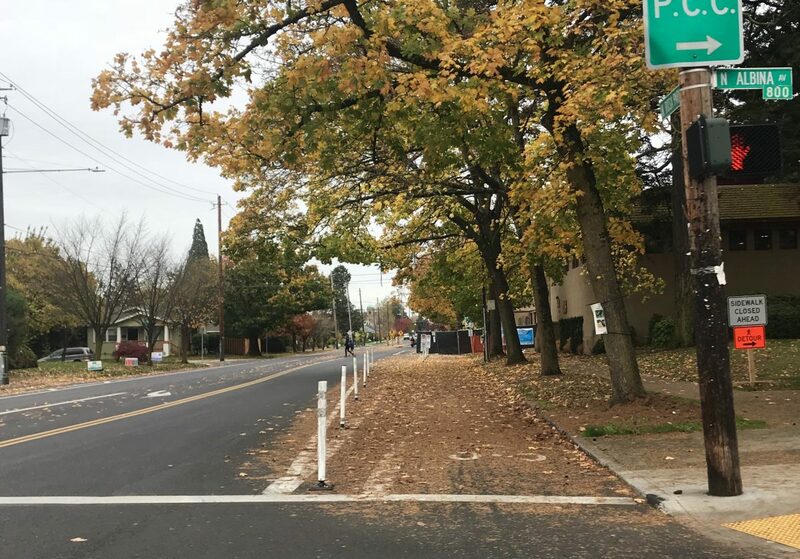 Yesterday the Oregonian featured a story about a new “leaf tax” being considered by Mayor-elect Sam Adams that would create “leaf districts” in areas of the city with many street trees.